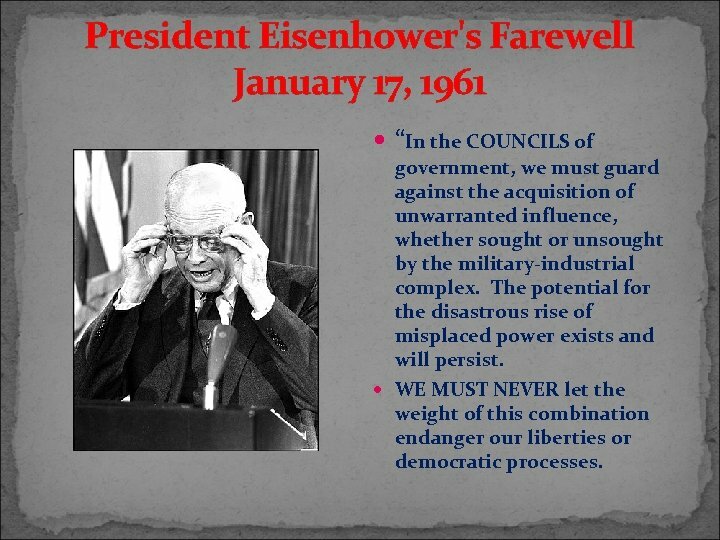 President Eisenhower's Farewell January 17, 1961 “In the COUNCILS of government, we must guard against the acquisition of unwarranted influence, whether sought or unsought by the military-industrial complex. The potential for the disastrous rise of misplaced power exists and will persist. WE MUST NEVER let the weight of this combination endanger our liberties or democratic processes. 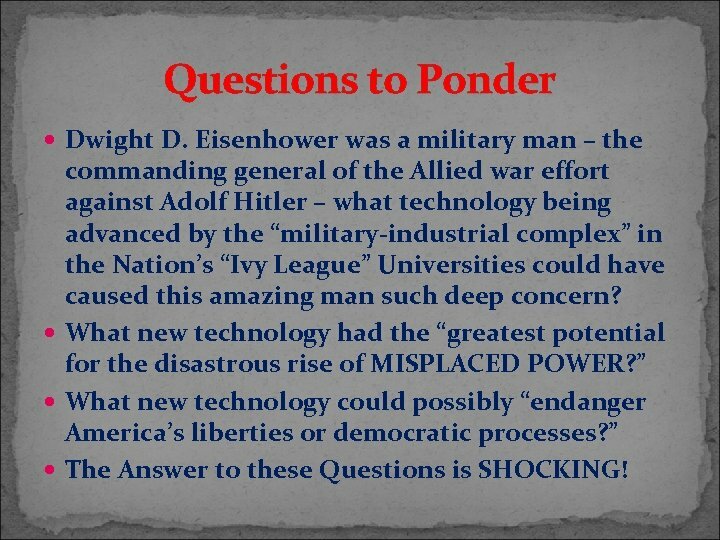 Questions to Ponder Dwight D. Eisenhower was a military man – the commanding general of the Allied war effort against Adolf Hitler – what technology being advanced by the “military-industrial complex” in the Nation’s “Ivy League” Universities could have caused this amazing man such deep concern? 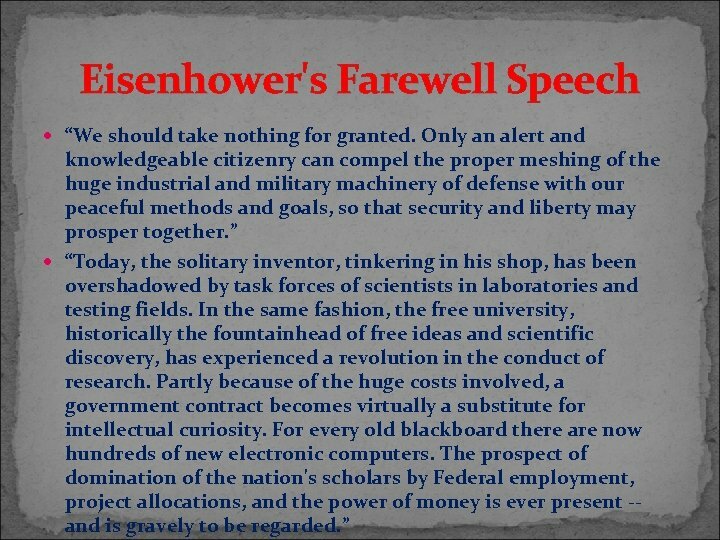 What new technology had the “greatest potential for the disastrous rise of MISPLACED POWER? 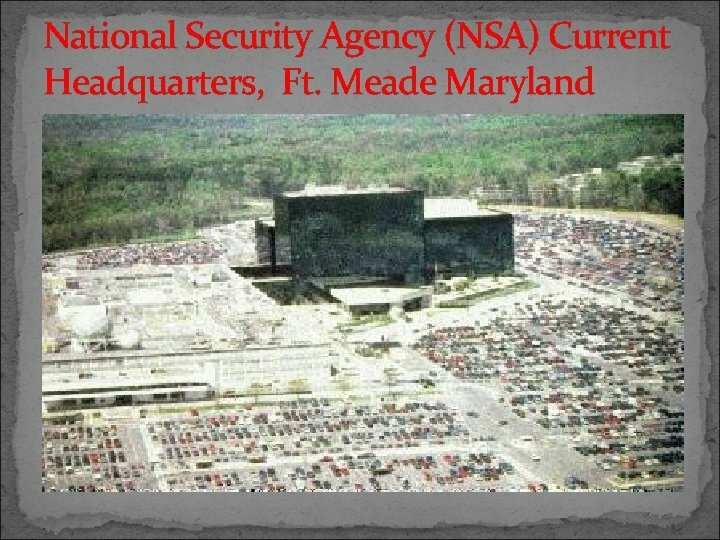 ” What new technology could possibly “endanger America’s liberties or democratic processes? ” The Answer to these Questions is SHOCKING! 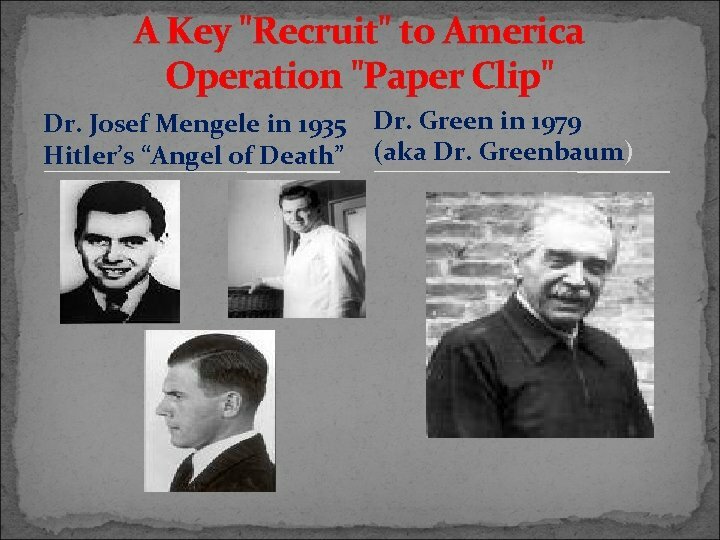 Operation Paper Clip Led to "MK ULTRA" Declassified documents of America’s O. S. S. (Which eventually was renamed the Central Intelligence Agency) detailed numerous Nazi “Scientists” that were expatriated into America’s University network to head up “RESEARCH PROJECTS” for the Rockefeller Foundation’s corporations – i. e. the “Miltary/Industrialist Complex”. 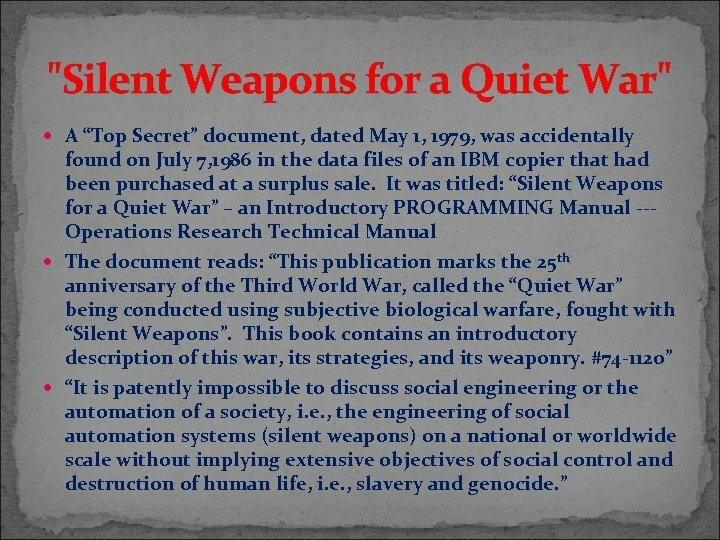 This was called “Operation Paper Clip” Most of these “scientists” had been deeply involved in studying something called “Silent Sound” technology --- military applications for MASS MIND CONTROL. 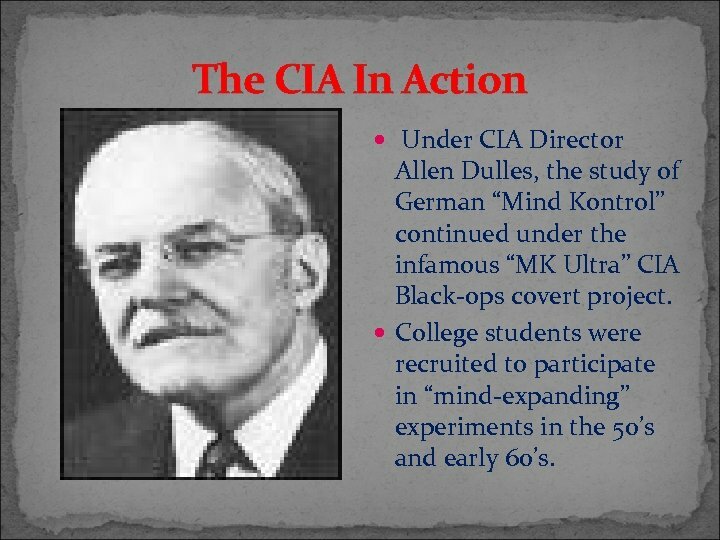 The CIA In Action Under CIA Director Allen Dulles, the study of German “Mind Kontrol” continued under the infamous “MK Ultra” CIA Black-ops covert project. 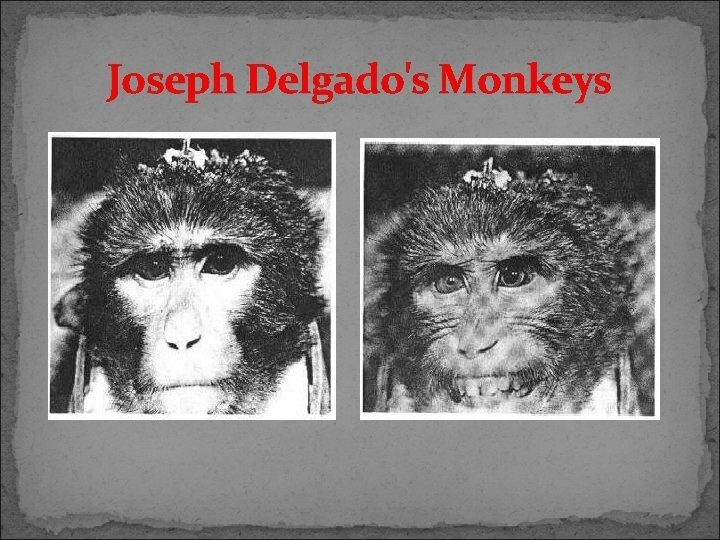 College students were recruited to participate in “mind-expanding” experiments in the 50’s and early 60’s. 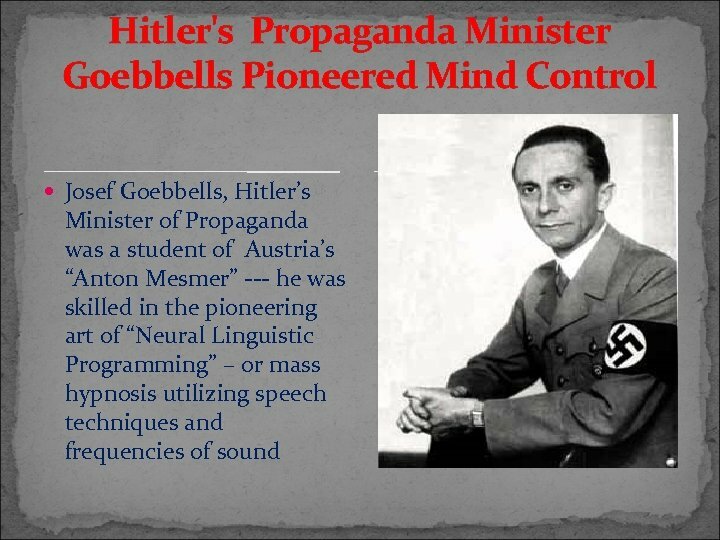 Allen Dulles' Links to Bush Nazis The book “Fortunate Son” by J. H. Hatfield documents how George HW Bush, and his father, Prescott Bush provided the necessary funds to bring Hitler to power. Prescott Bush was a cardcarrying Nazi, and was CONVICTED for his actions. 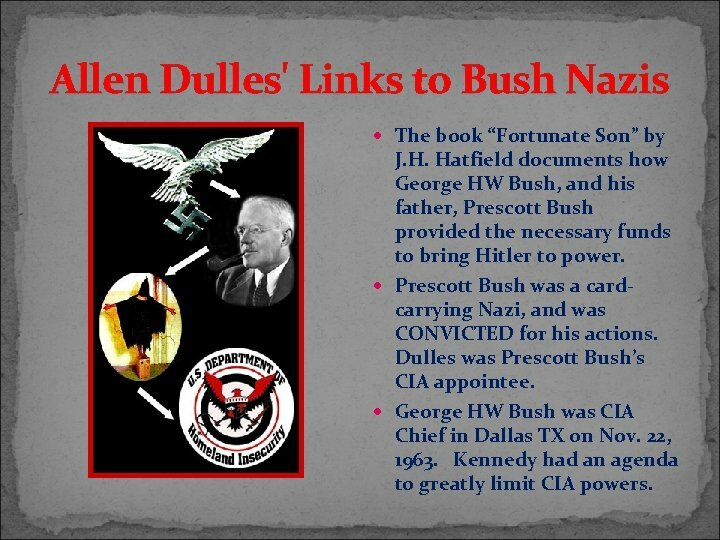 Dulles was Prescott Bush’s CIA appointee. 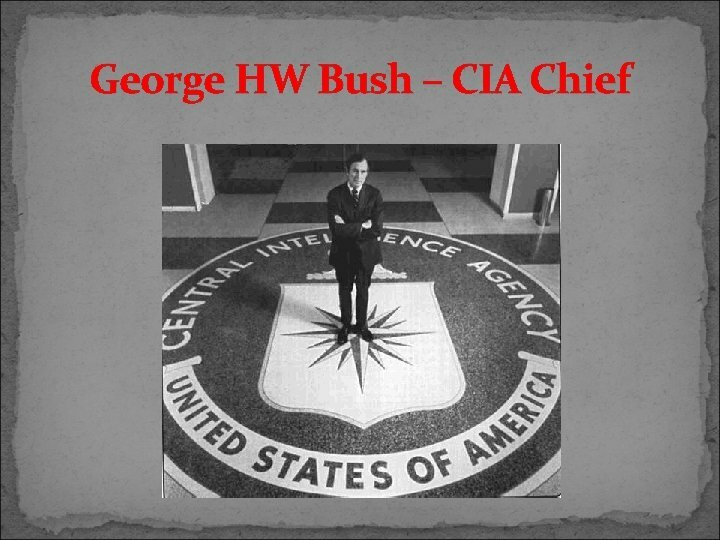 George HW Bush was CIA Chief in Dallas TX on Nov. 22, 1963. 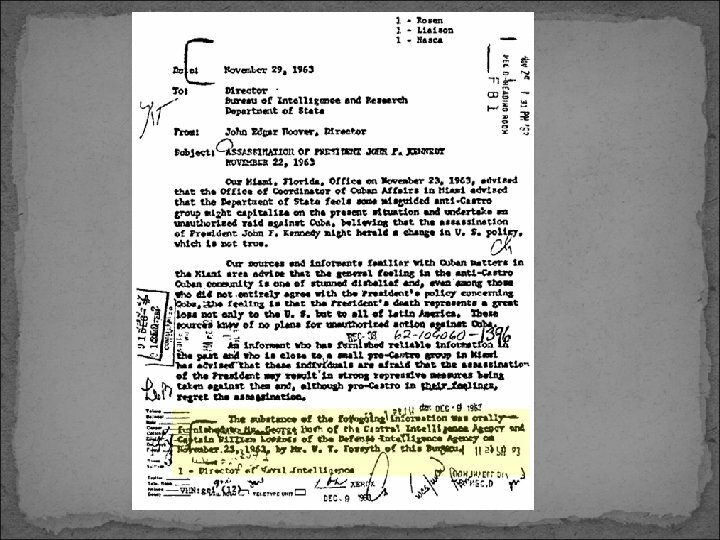 Kennedy had an agenda to greatly limit CIA powers. 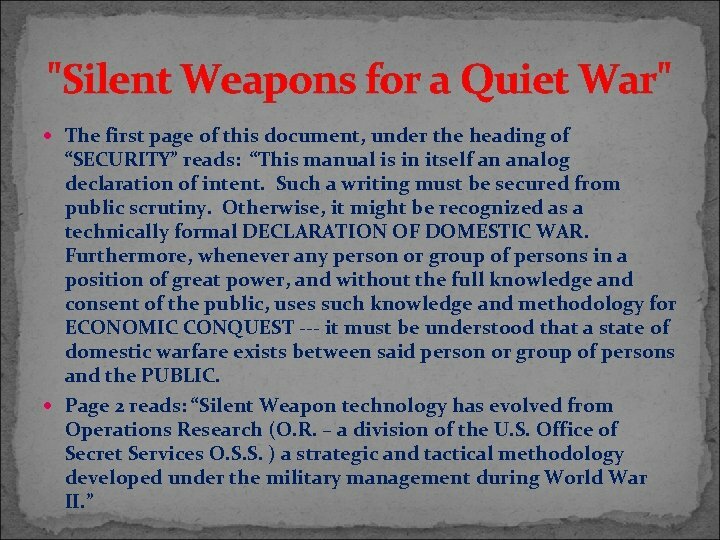 How Exactly Do "Silent Weapons" Operate? ? 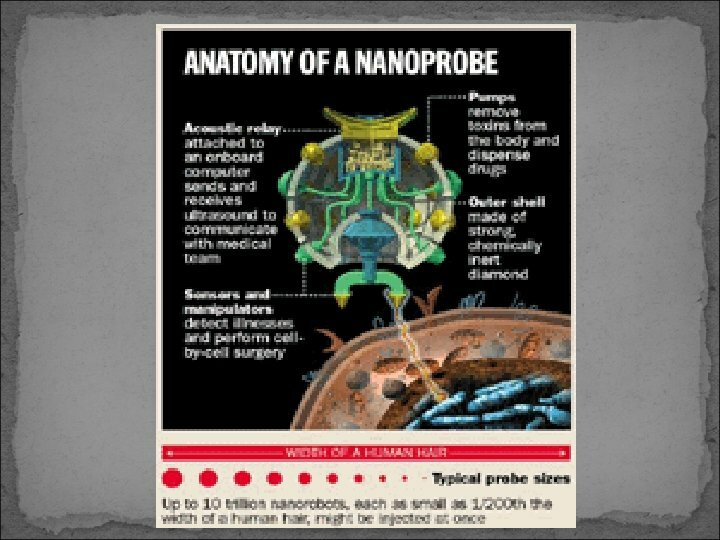 Has this "Weaponry" Actually Been Used in Combat? ? YES!!! 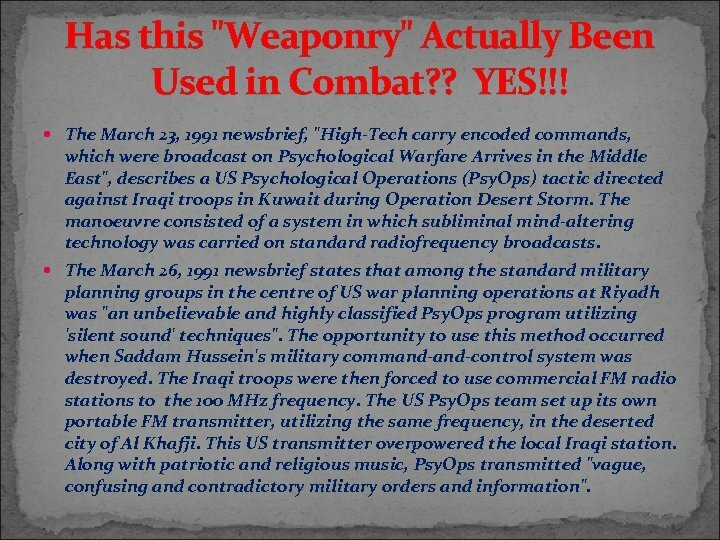 The March 23, 1991 newsbrief, "High-Tech carry encoded commands, which were broadcast on Psychological Warfare Arrives in the Middle East", describes a US Psychological Operations (Psy. Ops) tactic directed against Iraqi troops in Kuwait during Operation Desert Storm. 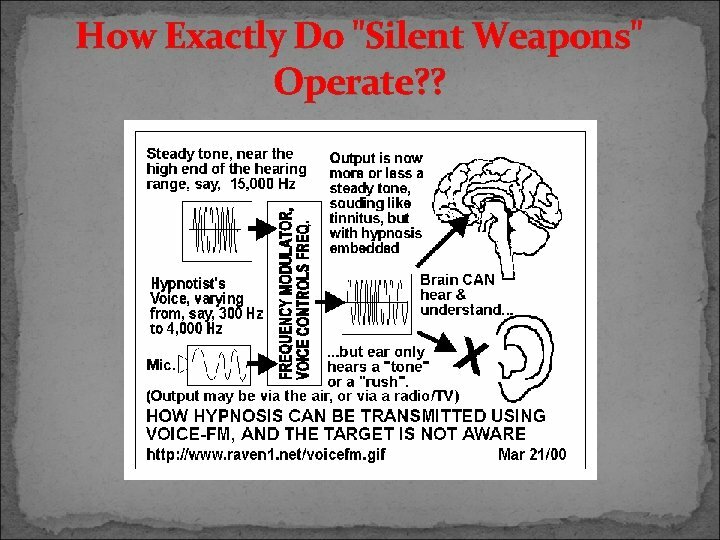 The manoeuvre consisted of a system in which subliminal mind-altering technology was carried on standard radiofrequency broadcasts. 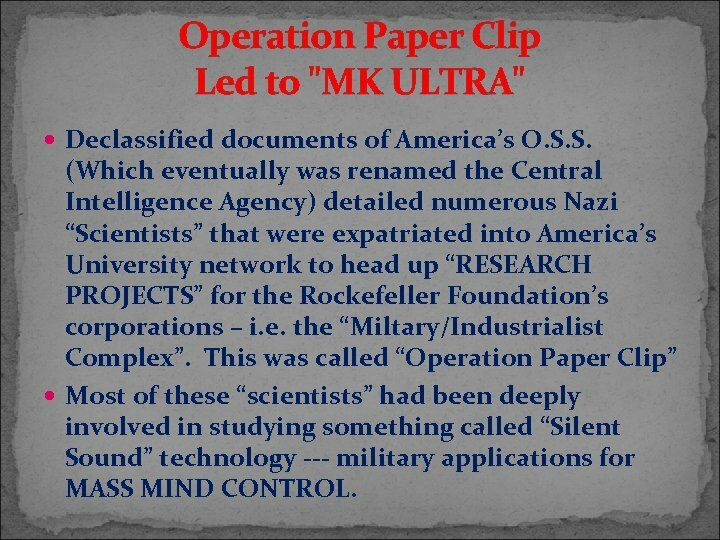 The March 26, 1991 newsbrief states that among the standard military planning groups in the centre of US war planning operations at Riyadh was "an unbelievable and highly classified Psy. 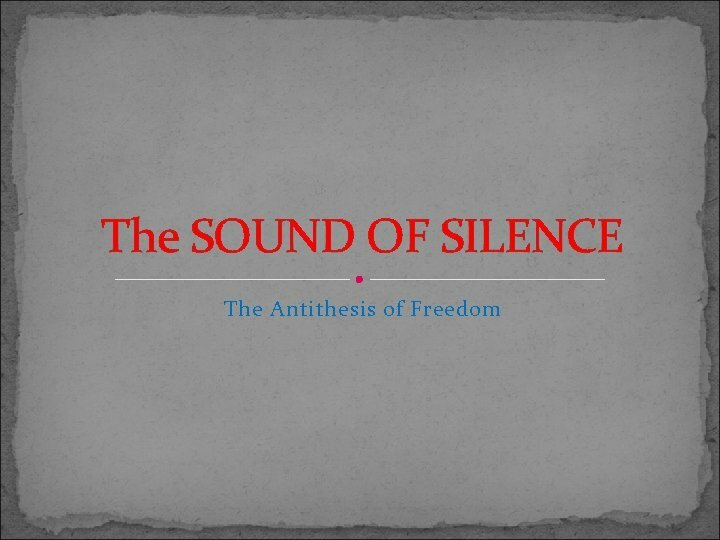 Ops program utilizing 'silent sound' techniques". The opportunity to use this method occurred when Saddam Hussein's military command-control system was destroyed. The Iraqi troops were then forced to use commercial FM radio stations to the 100 MHz frequency. The US Psy. Ops team set up its own portable FM transmitter, utilizing the same frequency, in the deserted city of Al Khafji. This US transmitter overpowered the local Iraqi station. Along with patriotic and religious music, Psy. Ops transmitted "vague, confusing and contradictory military orders and information". 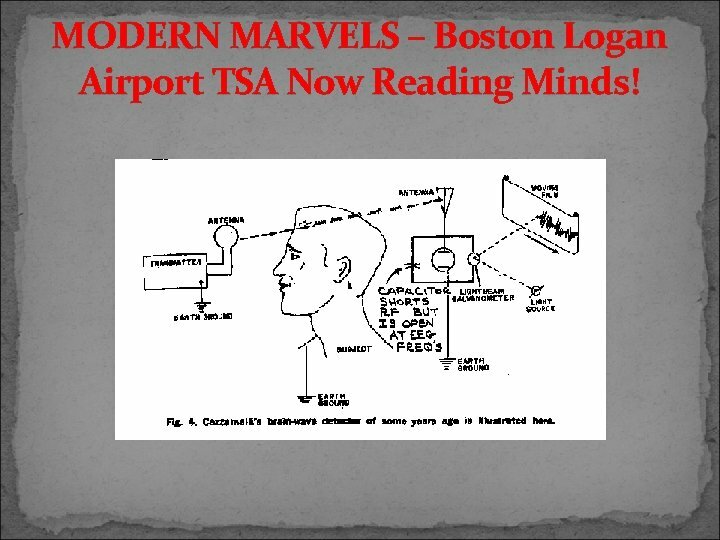 MODERN MARVELS – Boston Logan Airport TSA Now Reading Minds! The “Blair Witch Project? ? ? ” “People will do anything for those who encourage their dreams, justify their failures, allay their fears, confirm their suspicions, and help them throw rocks at their enemies. 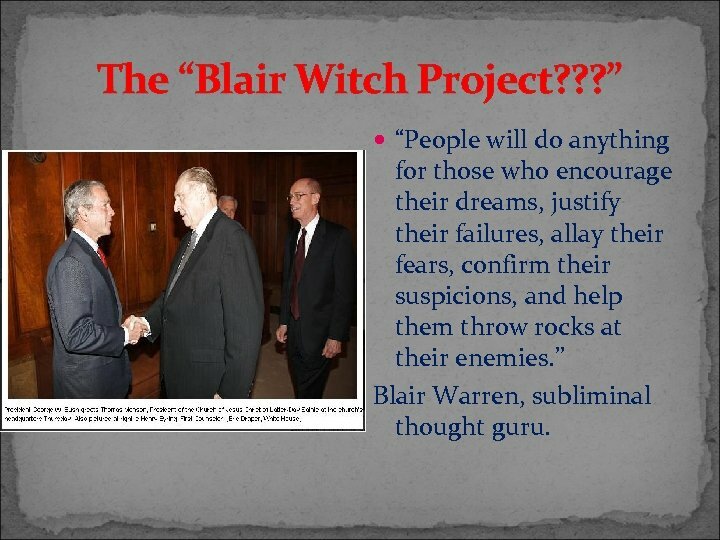 ” Blair Warren, subliminal thought guru. What Exactly is "Aegis Blue"? 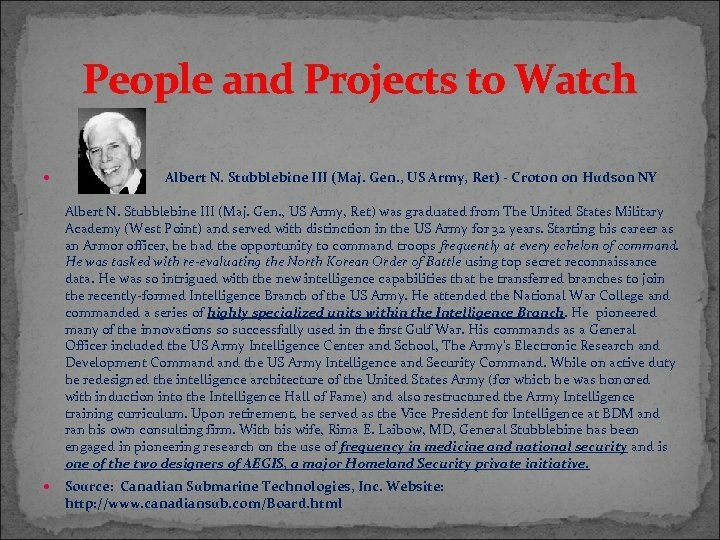 In a September 11, 2008 (the seventh anniversary of 9/11) Stubblebine’s “Aegis” project was announced in a press release. 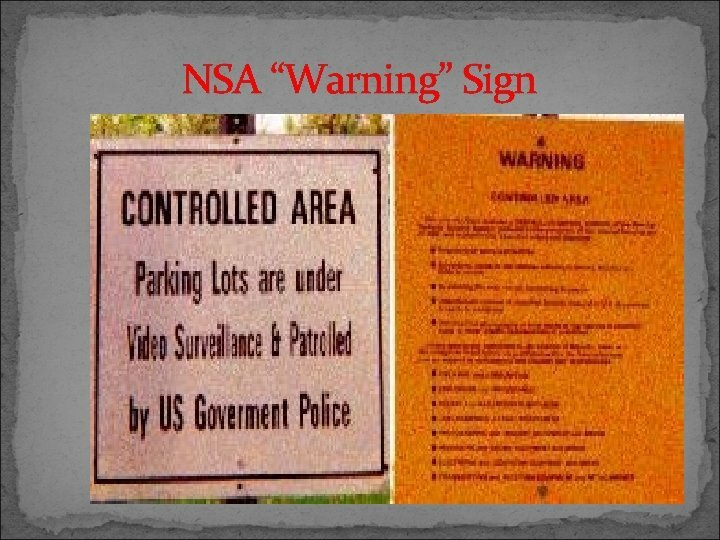 It is called V. A. S. S. T. – The “Vulnerability Assessment Security Survey Tool” This “Tool” apparently allows mobile “teams” of Homeland Security Agents to electronically “scan” a private home or residence searching for possible “vulnerabilities” to America. The Press Release states: “Aegis Bleu launched the first mobile physical infrastructure self assessment software tool. With it's mobile capability, VASST provides the most comprehensive, accurate, objective, and actionable physical infrastructure self assessment available. ” This will be done without due process, nor any search warrant, of course, all in the name of “Security from Terrorists”. 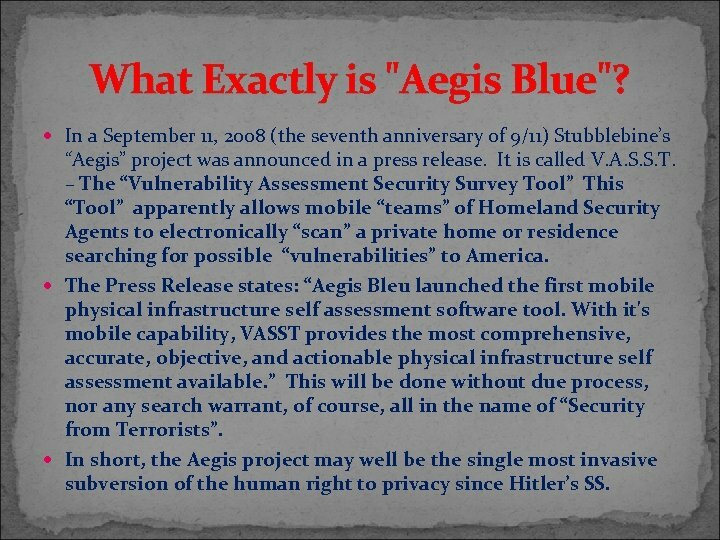 In short, the Aegis project may well be the single most invasive subversion of the human right to privacy since Hitler’s SS. 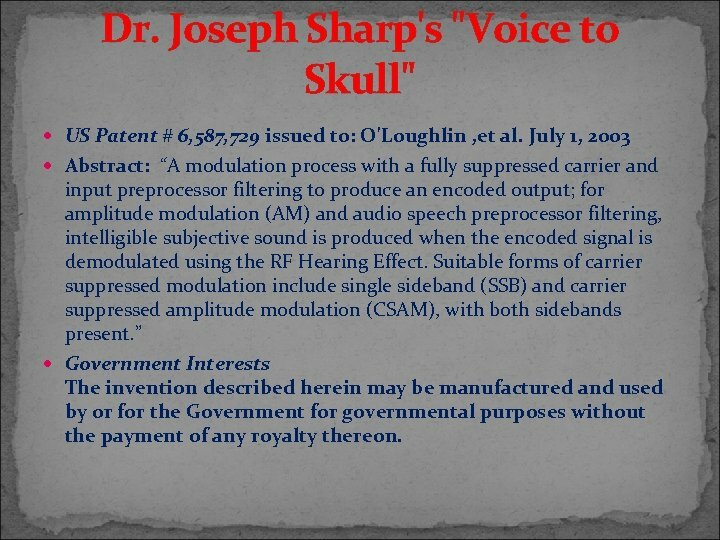 Dr. Joseph Sharp's "Voice to Skull" US Patent # 6, 587, 729 issued to: O'Loughlin , et al. 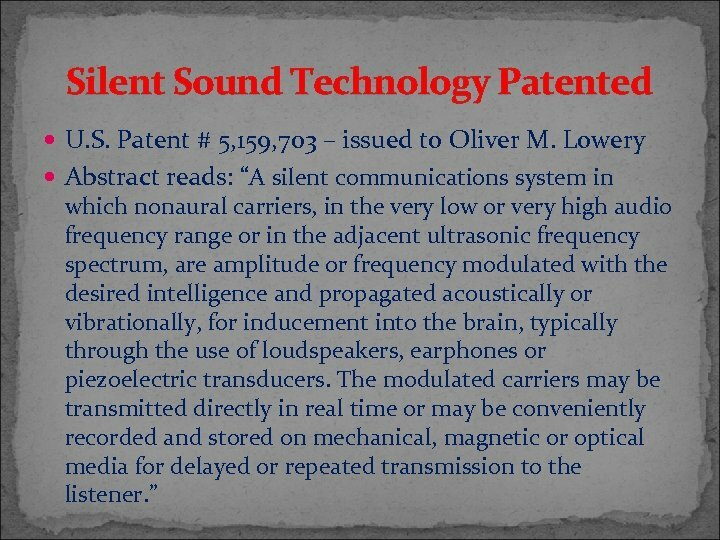 July 1, 2003 Abstract: “A modulation process with a fully suppressed carrier and input preprocessor filtering to produce an encoded output; for amplitude modulation (AM) and audio speech preprocessor filtering, intelligible subjective sound is produced when the encoded signal is demodulated using the RF Hearing Effect. Suitable forms of carrier suppressed modulation include single sideband (SSB) and carrier suppressed amplitude modulation (CSAM), with both sidebands present. ” Government Interests The invention described herein may be manufactured and used by or for the Government for governmental purposes without the payment of any royalty thereon. 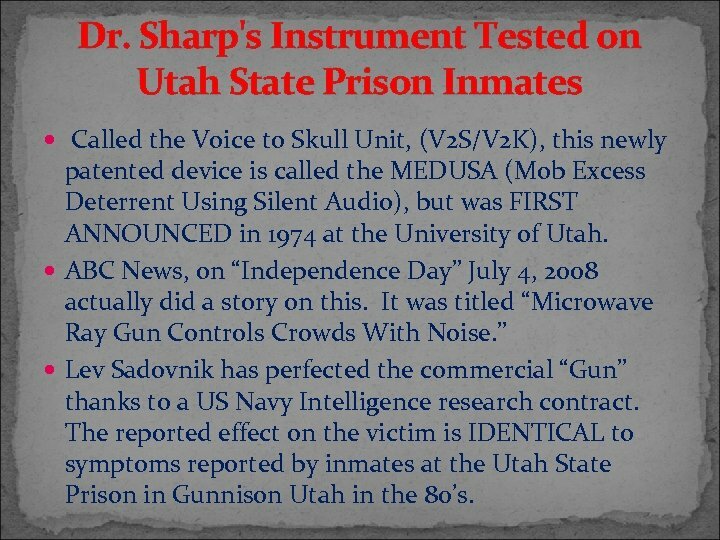 Dr. Sharp's Instrument Tested on Utah State Prison Inmates Called the Voice to Skull Unit, (V 2 S/V 2 K), this newly patented device is called the MEDUSA (Mob Excess Deterrent Using Silent Audio), but was FIRST ANNOUNCED in 1974 at the University of Utah. ABC News, on “Independence Day” July 4, 2008 actually did a story on this. 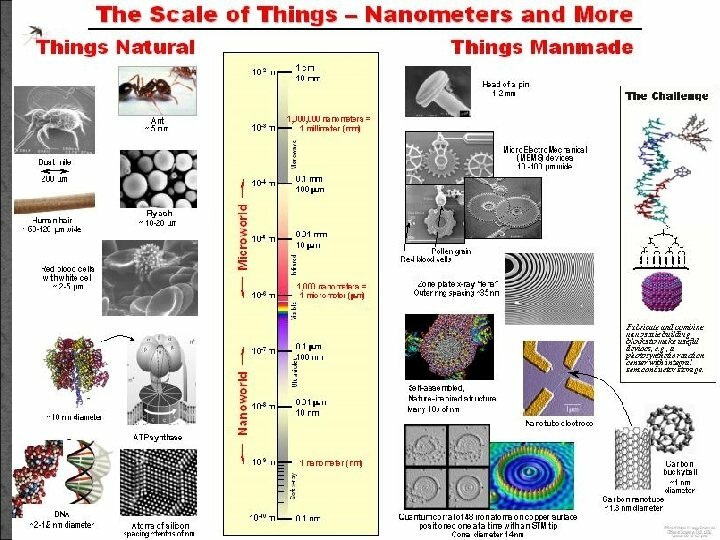 It was titled “Microwave Ray Gun Controls Crowds With Noise. ” Lev Sadovnik has perfected the commercial “Gun” thanks to a US Navy Intelligence research contract. 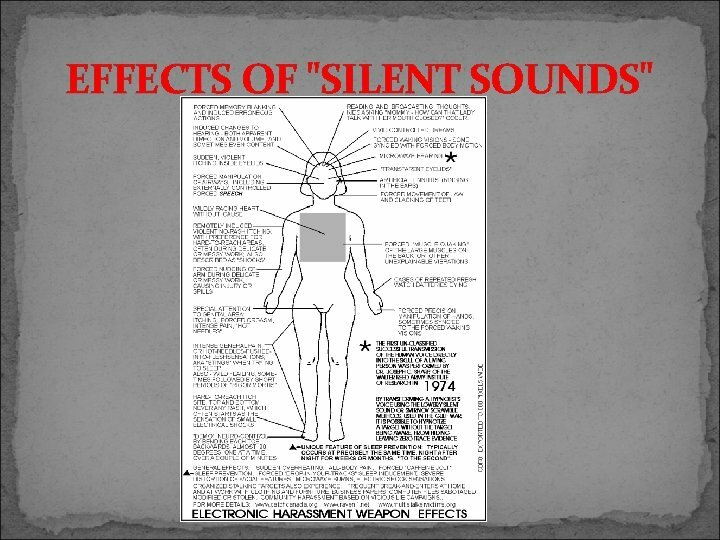 The reported effect on the victim is IDENTICAL to symptoms reported by inmates at the Utah State Prison in Gunnison Utah in the 80’s. 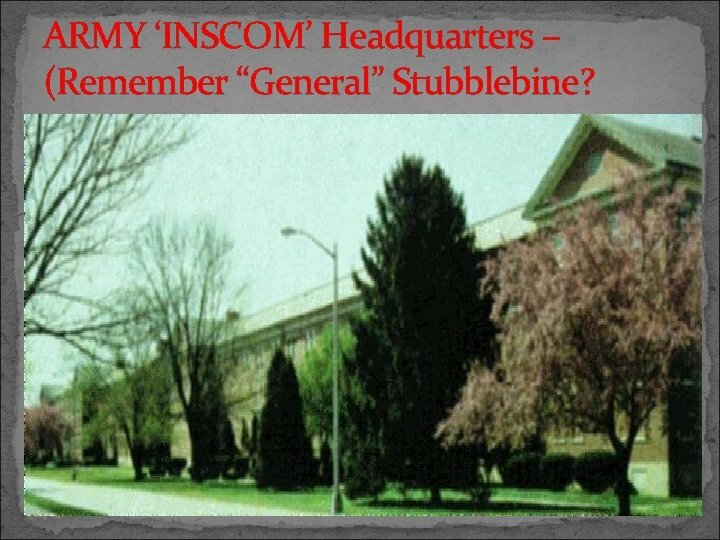 ARMY ‘INSCOM’ Headquarters – (Remember “General” Stubblebine? 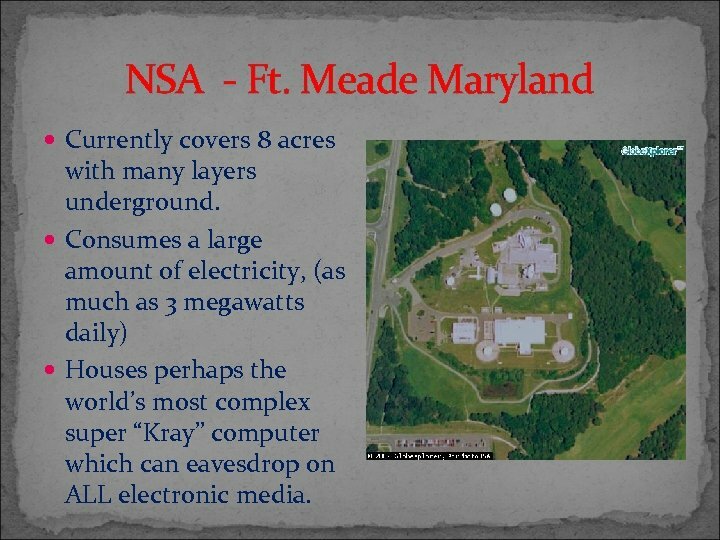 NSA - Ft. Meade Maryland Currently covers 8 acres with many layers underground. 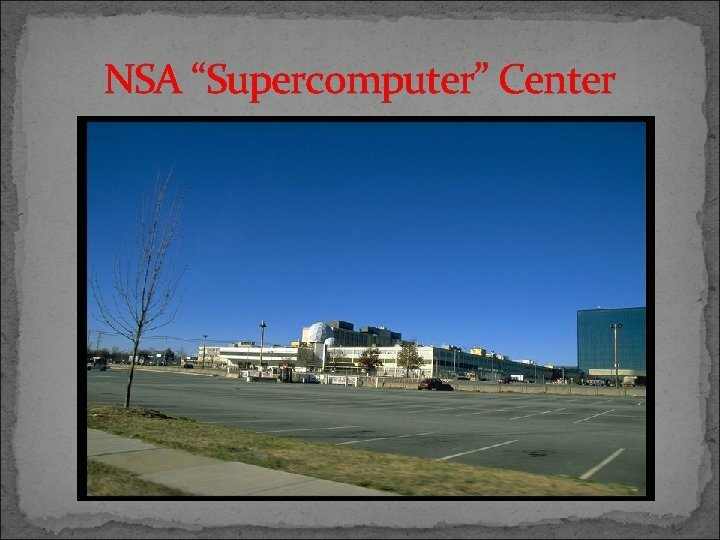 Consumes a large amount of electricity, (as much as 3 megawatts daily) Houses perhaps the world’s most complex super “Kray” computer which can eavesdrop on ALL electronic media. 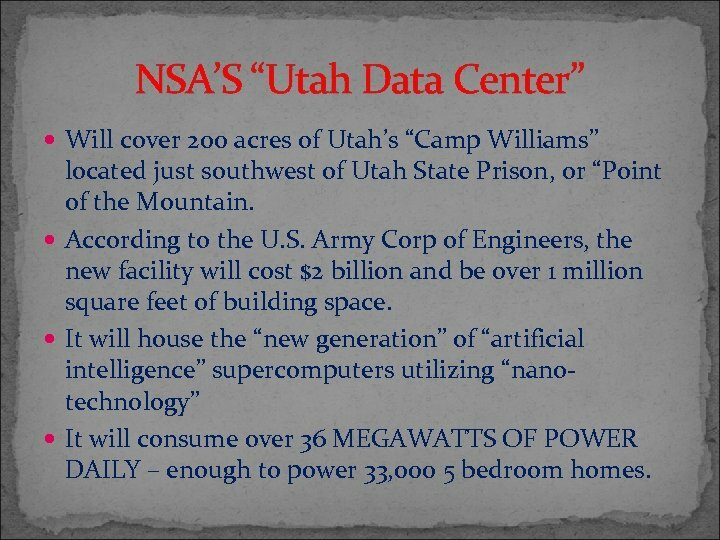 NSA’S “Utah Data Center” Will cover 200 acres of Utah’s “Camp Williams” located just southwest of Utah State Prison, or “Point of the Mountain. 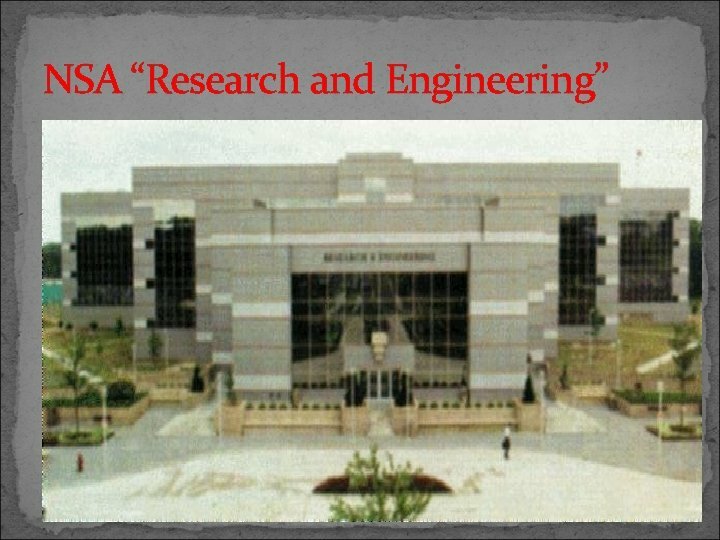 According to the U. S. Army Corp of Engineers, the new facility will cost $2 billion and be over 1 million square feet of building space. 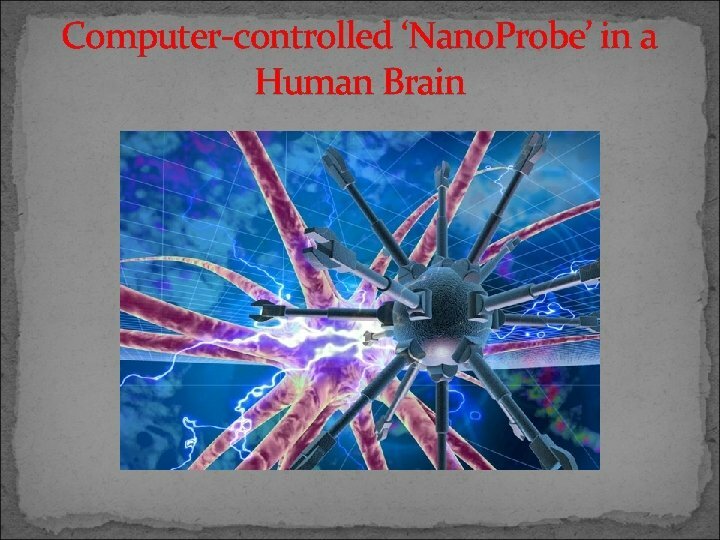 It will house the “new generation” of “artificial intelligence” supercomputers utilizing “nanotechnology” It will consume over 36 MEGAWATTS OF POWER DAILY – enough to power 33, 000 5 bedroom homes. 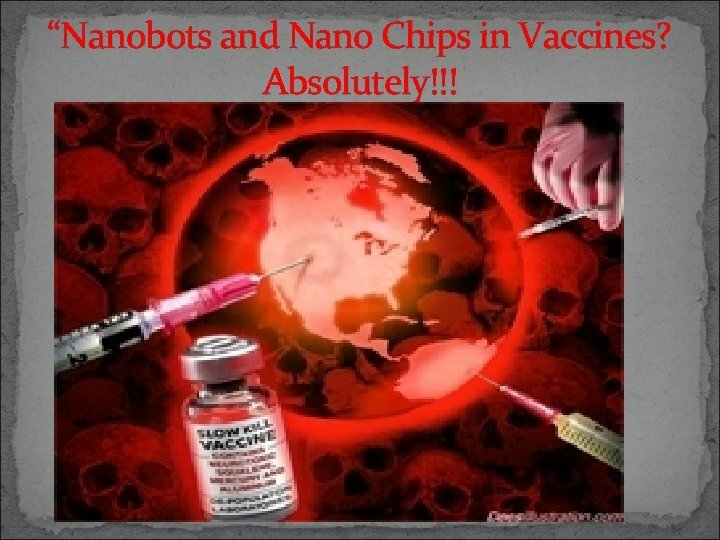 “Nanobots and Nano Chips in Vaccines? Absolutely!!! 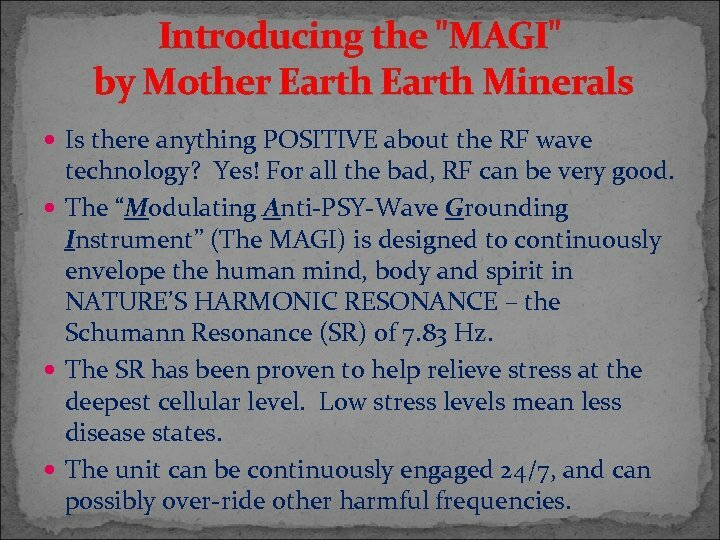 Introducing the "MAGI" by Mother Earth Minerals Is there anything POSITIVE about the RF wave technology? Yes! For all the bad, RF can be very good. 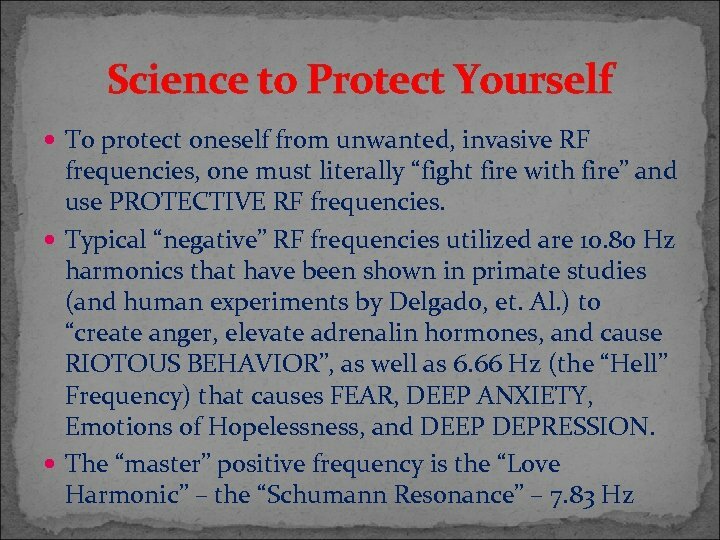 The “Modulating Anti-PSY-Wave Grounding Instrument” (The MAGI) is designed to continuously envelope the human mind, body and spirit in NATURE’S HARMONIC RESONANCE – the Schumann Resonance (SR) of 7. 83 Hz. The SR has been proven to help relieve stress at the deepest cellular level. Low stress levels mean less disease states. 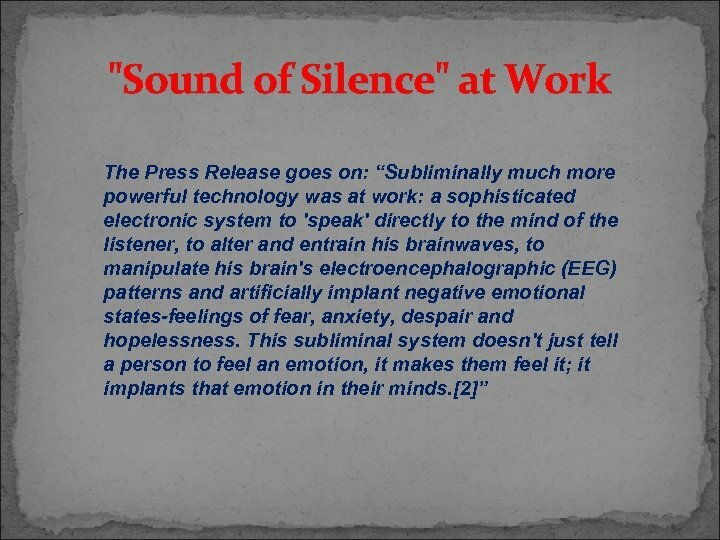 The unit can be continuously engaged 24/7, and can possibly over-ride other harmful frequencies. English Phonetics A Theoretical Course LECTURE 1.